Kobusch, part of the US-based Sun Capital Partners and the company, has ordered again six full electric thermoforming machines model FC780 E IM2 Speemaster Plus from W M based in Switzerland for its production of aPET, rPET food packaging containers. 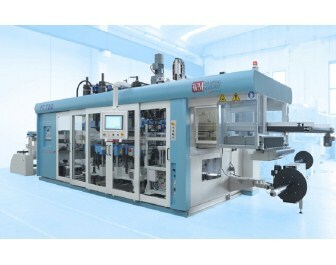 W M’s FC780 E IM2 Speedmaster Plus represents its last evolution of electric thermoforming machines and it has maximum tool dimensions of 780 x 570mm and a maximum forming height positive/negative of 130mm. As stated, the machine movements are made with servo-motors which allow high rates of production up to 54 cycles per minute, depending on the material, and reduced energy consumption. The sheet heating section is equipped with both upper and lower heater banks with infra-red ceramic heating elements with independently controlled zones which allows, according to the type of material being processed, the optimization of the heating phase. Forming is by means of compressed air up eight bar and vacuum, which can be programmed in the required sequence with quick change between the upper and lower platens. The products are cut out using heated steel rule blades and then automatically counted and stacked. The forming unit, whit a toggle closing, guided by four tie bars, develops a power of 75 tons on four points of the platen. This allows a better rigidity of mold closing and also a force repartition and also the possibility to form and cut in place, according to W M.
The regulation of upper and lower platens heights is electric and it is available also the electric independent motion for plugs: “third motion”. The cutting unit, whit a toggle closing, guided by four tie bars, develops a power of 60tons. This allows a better rigidity and planarity and a better cutting force repartition. The adjustments of the upper and lower heights is electric. It is possible to read the forming and cutting real used force on the machine monitor. All the adjustments and settings are made through the keyboard and color LCD monitor which are mounted on a control panel fitted to a sliding arm. All of the input data and recipes can be stored on a USB memory stick and a printer port can be used to reproduce paper copies of all of the video pages. A new software is developed in order to supply an automatic regulation of the machine parameters, says the company. The machine is able, considering all these parameters, to launch the automatic cycle optimized at 90%. The machine is compact thanks to the integration of the electric cabinet in the dimensions of the machine. The side operator is also more accessible the side to facilitate the quick mold change thanks also to the special supports for tools extraction. More importantly, it presents a new design with more important transparent surface. Remote service assistance with a new access hardware support (GateManager) is on the machine, with the advantage of higher speed without phone connection costs assures an after-sale assistance service more efficient and precise all over the world. W M says all the FC Speedmaster Plus machines can process all thermoplastics sheets under optimal conditions using vacuum and compressed air, including: PS-OPS-EPS-PP-UPVC-APET-PETG-RPET-PLA multilayer and barrier materials. Pre-heating ovens models PH 920 and PH1100 are available for the pre-treatment of PP material.